If you’re looking for an unpretentious, cheap travel New England beach destination, Old Orchard Beach, Maine, offers waves of fun at the Palace Playland amusement park and the beautiful seven-mile beach. A classic Memorial Day to Labor Day Weekend travel and vacation spot, the great stretch of Maine ocean beach affords room for everyone while the four-acre Palace Playland features 26 rides, including a Ferris Wheel with a brand new LED lighting display, carousel, roller coaster, crashing tea cups, fun house, tilt-a-whirl, mini golf, and 24,000 sq. ft. arcade area. Palace Playland also features Thursday night summer fireworks displays at 9:45 p.m., as well as a special holiday show on July 4th. The nearby Pier, extends 500 ft. over the Atlantic Ocean, offering more summer fun with shops, restaurants and nightlife. In the general area, it seems like there’s enough fried dough, pizza, cotton candy and other classic summer junk food to feed the state! 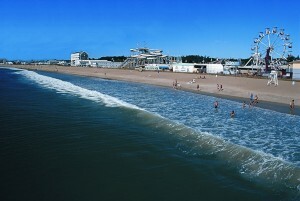 Palace Playland and the beach. Also, when compared with other amusement parks, Palace Playland is a terrific deal. You can check out the Palace Playground site here for current rates. We may no longer have Paragon Park at Nantasket Beach in Hull, Mass., so it’s heartwarming to see Old Orchard Beach thriving. But, in one form or another, Old Orchard Beach has been that way as a popular vacation destination since 1870, pleasing vacationers world-wide (including a significant local and Canadian summer turnout). It’s known as a great family travel destination, but you’ll also see all walks of life here to visit for a day or spend an extended vacation. We hope you get to visit this classic New England coastal destination! For more information, log onto the Old Orchard Beach web site. ← New Kids at the Beardsley Zoo in Bridgeport, Conn.